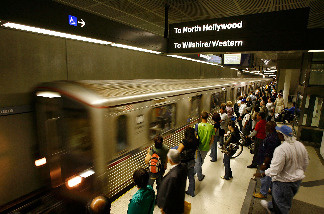 Passengers wait for Metrolink subway trains during rush hour June 3, 2008 in Los Angeles, California. July 14 isn’t just Bastille Day in France. It’s a big anniversary for Los Angeles County Metro. The transportation agency’s community relations manager Jody Litvak says that 20 years ago, Metro opened its first light rail line. "I think it’s actually fairly remarkable what this county has done in just 20 years," said Litvak. "We’ve opened the Blue Line to Long Beach, the Green Line east-west through the southern portion of the county, the heavy rail subway Red and Purple line out to Wilshire/Western out to North Hollywood. The Orange Line in the Valley. The Gold Line out to Pasadena and to East L.A. So it’s actually a pretty remarkable anniversary and we got lots more coming." Litvak spent the anniversary making presentations about Metro’s designs for the proposed Westside subway extension.